One of my son’s Christmas presents was a the set of How to Train your Dragon books written by Cressida Cowell. I must admit that I when I ordered the set I was not sure if it was going to be right for him, I was concerned about the reading level but I had that parent-gut feeling that he was going to love the stories. So when I found the set on special I just ordered them. They are currently a bit on the difficult side for him but we “family read” books so we decided to try these and………………….Wow what a HIT. My daughter (who is normally highly sensitive about what she reads) sits with us as we read, totally engrossed in the story. My son does find the reading a bit tough going but he tries hard to follow and when he gets a bit lost he sometimes takes a break from following and then when he is ready to rejoin, asks where we are. We have been ploughing through the stories (reading for an hour or longer at one go) and although we still have a number of books to read (there are 10 books in the set) the books are already spurring on lots of fun chats, chats about new words, viking boats, the weather and how could you survive with such primitive tools and of course the imaginative side – the dragons. The dragons have been a great source of creative fun in our house. Both kids have been creating their own dragons, with special powers and unique quirks. A few have even made into art work. One of the things you are constantly aware while reading the stories is the harsh weather and rough seas encountered. I love that my daughter had a go at trying to create a more expressive painting showing a stormy sea. And yes theses are fiction books, filled with imaginative creatures and places but the stories have captivated the kids to such an extent that it is so easy to swing the conversation onto Viking Longboats, Scandinavia, invasions, anything remotely linked is listened to/ watched with great interest. As much as I love these books, oh boy do I love this series because of how it manages to inspired so much creativity and because the Hero is the kid who everyone would least expect to be a Hero (as a mum of two kids with sensory processing disorder this is amazing for my kids to read), the home educating mom part of me could not resist trying a Viking craft. There are a number of different examples of the Rune alphabet on Pinterest so we choose one and we had a go at making some Viking necklaces. The kids wrote names on some tin foil (sharpies work really well on tin foil) and then we cut out some card, stuck the tin foil on the card and wrapped it around the card, used a hole punch to create a hole and attached some string. Really one of the easiest, simplest craft activities that we have ever done but such a hit. (You can now only enter the Viking village, which is a room in our house if you are wearing your Viking necklace). And writing in Viking Runes did not stop there. After my daughter had made necklace after necklace she started writing out sentences, just for fun. These books have been one of the best sets we have bought. Yes the writing is a bit difficult for my son at the moment, but he is trying hard to follow as I read so I know he is learning and I am convinced that at some stage he is going to go back and re-read these books to himself. This entry was posted in Book Ideas and tagged Best kids books, dragons, English Ideas, History, home ed, home education, homeschooling, Vikings. Bookmark the permalink. The book sound lovely….and I am sure in a few months time, he will remember a story and want to read the books himself. I’m so impressed! I love using books to create a unit study like you have here. My son likes this series as well. Great paintings and Viking necklace. My son loved the stories too! 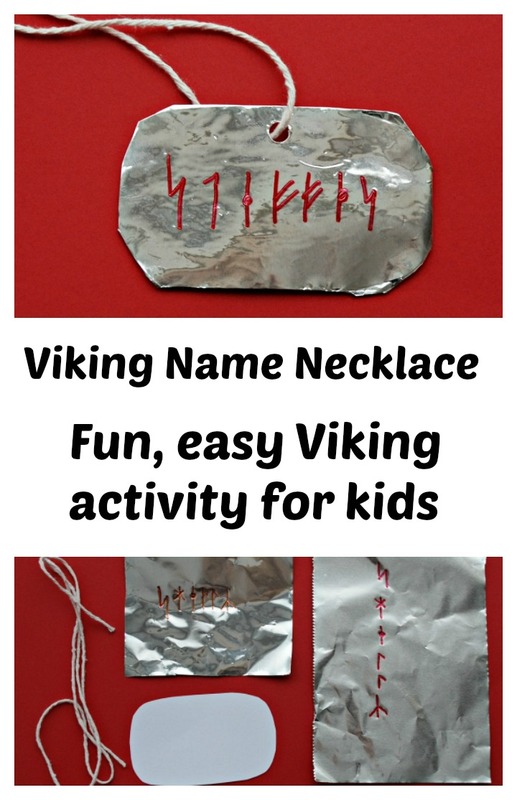 I am using your runic necklace idea fir a group of Beaver Scouts learning about Norway! Thanks for the awesomeness!